AMD has launched its new flagship GPU, the Radeon VII, around the world. First announced as a surprise at AMD CEO Lisa Su’s CES 2019 keynote, the Radeon VII is billed as the world’s first 7nm consumer GPU and supersedes the Radeon Vega 64 at the top of the company’s Radeon GPU lineup. AMD is targeting this release not only at enthusiasts and gamers, but also at creative professionals in the VR, game, and video industries. The company promises exceptional performance for gaming at 4K, ultrawide 1440p, or 1080p with HDR. Performance in games is said to be up to 29 percent better than that of the Radeon Vega 64 on average. Graphics cards based on the Radeon VII are available for purchase worldwide immediately, priced at $699 in the US and Rs. 54,990 in India with three free games: The Division 2, Resident Evil 2, and Devil May Cry 5. All cards being sold as of now will use AMD’s own reference design, which features a triple-fan cooler for the first time. Manufacturers have not announced whether or when they might introduce custom designs of their own. The AMD Radeon VII GPU has 3,840 execution units, which the company calls stream processors. It is clocked at 1400MHz with a maximum boost speed of 1750MHz. Total graphics performance bandwidth is rated at 13.8 Teraflops. The GPU is manufactured on AMD’s 7nm process, and uses a refreshed version of the Vega architecture that underpins last year’s Radeon Vega 56 and Radeon Vega 64 GPUs. AMD boasts of a whopping 16GB of high-bandwidth 3D-stacked HBM2 memory which is integrated onto the GPU die and is connected using a 4,096-bit bus for a total memory bandwidth of 1TBps. This is double the memory and 2.1X the memory bandwidth of the Radeon Vega 64. According to AMD, several current-day games including Far Cry 5, COD: Black Ops 4, and Metro: Exodus can exceed 8GB of memory usage when played at 4K using the highest settings, and productivity applications can also do the same, such as Adobe Premiere when editing 4K or 8K video. Power consumption is rated at 300W. The Radeon VII supports all of AMD’s software features including FreeSync 2, Radeon Chill, performance tweaking with Radeon WattMan, and video stream capturing with Radeon ReLive. The Radeon VII will go up against Nvidia’s GeForce RTX 2080, but the company is not claiming that it can dethrone the more powerful GeForce RTX 2080 Ti, which means that AMD is not quite in a position to take the overall market leader crown even with this launch. Nvidia CEO Jen-Hsun Huang derided AMD and the Radeon VII in a session with journalists at CES, calling it “underwhelming” and “lousy”. Rumours about restricted availability began appearing in January, following the announcement at CES. It was first reported that there will not be any custom-designed cards at all from AMD’s partners, and that the total production run would be just 5,000 units. 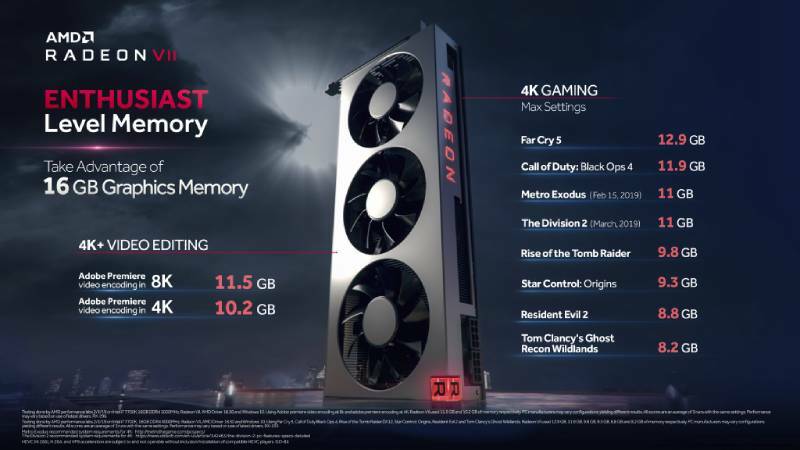 Lending some credence to that, fresh rumours in the days preceding the launch suggest that only 100 Radeon VII cards will be sold in the UK and just 20 each will be sold in France and Spain. AMD is reportedly also still preparing its next-gen Navi architecture for release later in 2019.